BUT, the show must go on, and I need to get back into the groove, and I want to get back into the groove. Blogging keeps me connected with the beauty world, keeps me connected with my followers a fellow bloggers and overall keeps my writing and mind sharp. Today is the second time I have worn this foundation and I received soooo many compliments on it, I was shocked. I was told twice how flawless my skin looked and asked what foundation I had used. I must say, this is the second time I have tried this foundation out, and the first time, I was not impressed. I was very distraught that the foundation felt very dry and I had a hard time applying it without patchy-ness or dry areas picking up…however, I quickly realized that the brush I was also trying out on the same day to apply the foundation was actually the problem. I found that my foundation was creating the “makeup mustache” that I completely loathe and I almost gave up on the poor foundation. Today, I decided to give it a new approach and try the product out again, this time I applied with my hands. For the longest time I had applied my foundation with my fingers and I stopped once brushes and sponges came out into the makeup world as alternative ways to apply foundation. However, in a Tati Westbrook video I watched today, she went in right with her hands and applied the foundation and then bounced and pressed it all in with her Beauty Blender for even application, therefore, I figured if its good enough for Tati, its good enough for me. I have now been wearing the foundation for over eight hours and I see no excess oil in my T-Zone, and minimal breakage in the creases of my nostrils- I believe I will fix this next time with some “baking” techniques. I have no “makeup mustache” which is my biggest fear and no creasing on my under eye! This foundation dries down very nice and powdery, my skin does not feel or look cakey which I am so glad for seeing that I did apply it with my fingers. I had been wanting to try this foundation for sometime now and I am so glad I did. Big shout out to my best friend Laida for picking this up for me while we were in New Jersey on vacation. I have to say I have yet to be disappointed with No7 products and I will continue to experiment with not only their skin care, but their cosmetics line as well. I hope you found this informational and if you are interested in No7 cosmetics, I highly suggest you give them a try- 10/10 from my camp! Thanks for this info. 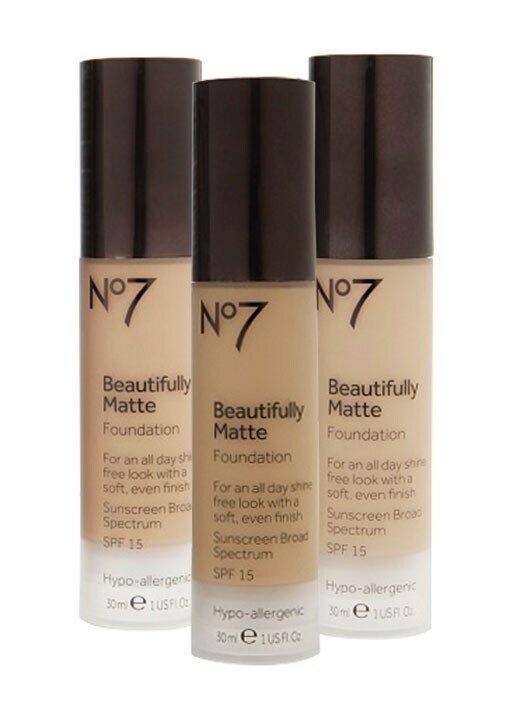 Didn’t even know that No7 now has foundations.